A “Paschal Candle” could also be called an “Easter Candle”. The word “paschal” comes from “Passover [πάσχα]”, the great event of Israel’s deliverance from Egypt that reached a greater fulfilment when Jesus Christ died and rose from the dead. Jesus is our paschal lamb (I Cor. 5:7). When Christ died upon the cross on the first Good Friday, the world was plunged into darkness for three hours. He rose on Easter morning at first light. Candles have always symbolised the light that Christ brought into the world (Jn 1:9), but at Easter they particularly recall the light of His resurrection life. Many churches strip the altar at the end of the service on Holy Thursday and hold their Good Friday services without paraments or candles on the altar. At the Saturday service called the Easter Vigil it was traditional to bring “new fire” to a candle in the darkness of that most holy night while waiting for the resurrection of Christ on Easter morn. This new candle was known as the Paschal Candle. Some medieval examples were monumental, celebrating Easter with great exuberance: a candle at Salisbury Cathedral was 12 metres tall, and one at Westminister Abbey weighed over 700 kg. It should, in any case, tower above all other candles in the church to highlight this central mystery of our faith. 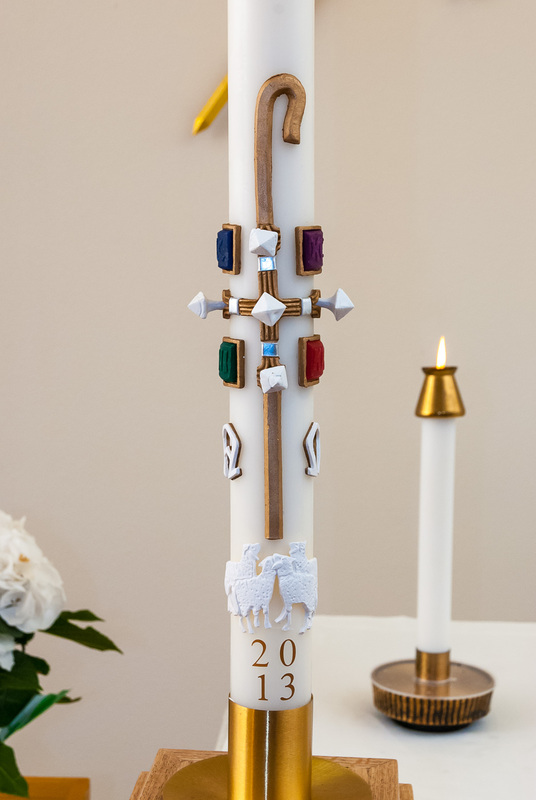 The Paschal Candle is traditionally decorated with symbols to remind us of Christ: the Alpha and Omega (Rev. 1:8; 21:6; 22:13), the year of our Lord to remind us that our times are always in His hands (Heb. 13:8), and a cross with five nails to represent His death and wounds for us. The candle is lit for the Easter season, from the Vigil until Pentecost, to symbolise the resurrected life of Christ, and placed at the north end of the altar. Subsequently it is placed by the font and lit at each Baptism to remind us that in Baptism we die and rise with Christ. Finally, it is placed at the head of the casket and lit for funerals to remind us that our bodies will rise because of their unity with Christ. 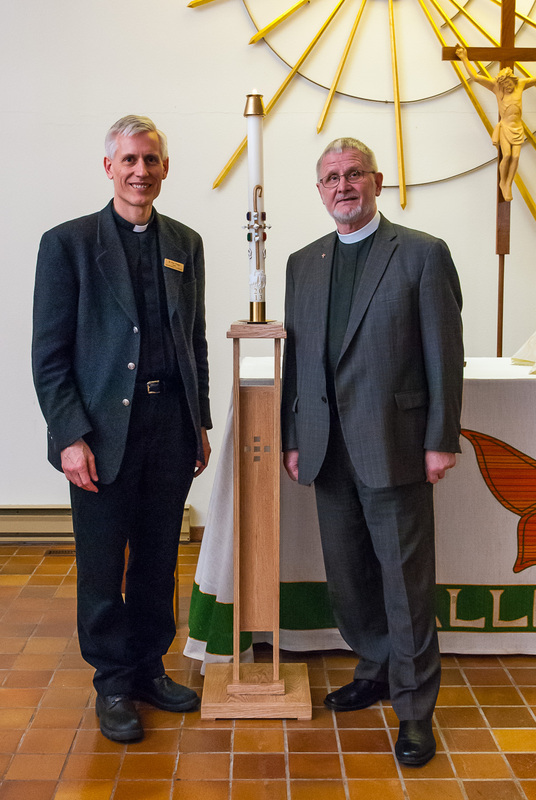 The seminary’s new paschal candle and stand were donated by Rev. Dr Wilhelm Torgerson and his sisters Susan and Anneliese in memory of their parents Anneliese and Ralph Torgerson. The oak stand was handcrafted by Mr Wally Reinhardt to match the existing seminary furniture. The candle chosen for this year includes the image of sheep to remind us of Christ’s resurrection appearance to Peter, saying, “Feed My sheep” (Jn 21:17).